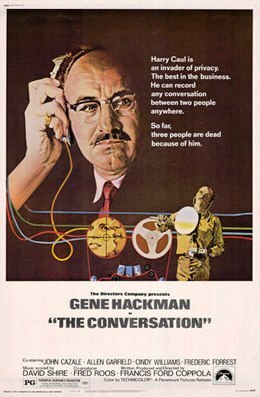 The Conversation stars Gene Hackman, who seemed to be in every other movie back in the 70s. It’s one of his best performances. Also appearing are John Cazale, Allen Garfield, Cindy Williams, Frederic Forrest, Harrison Ford, Teri Garr, and Robert Duvall. Hackman’s character is Harry Caul, a small-time surveillance-company operator who mostly works on dull and routine domestic cases and such. It’s a living, but the job has clearly taken a psychological toll. One day, Caul is hired to follow a couple, and at first, it does not seem to be much more than another routine assignment. As it turns out, however, something on Caul’s secret audio-recording of the couple doesn’t seem right. Things get murkier and much darker and more mysterious from there, and as the rest of the film recounts. The Conversation was released in the Watergate era, which gave its theme of secret recording, wiretaps, and other dubious surveillance a special relevance. It’s not like a lot of conspiracy films that have very overt political themes, but it has a similar psychological approach. It also has a lot of the moral ambiguity that is associated with the genre. It’s arguably among the most distinctive and best conspiracy-themed films from any era. As Copolla himself has said, The Conversation draws some inspiration from Michelangelo Antonioni’s earlier film, Blow-up (1966). (Copolla talks about this in an NPR interview available here.) Blow-up involves photography, rather than audio recording, and its plot differs in a number of ways from Copolla’s film. Yet, it has at its core something that many conspiracy- and political paranoia films have: foreboding situations in which the characters have only a partial idea of what is going on. It also features an excellent cast, including Vanessa Redgrave, Sarah Miles, John Castle, Jane Birkin, Tsai Chin, Peter Bowles, and others. It’s well worth watching in its own right. Another film in a similar vein that is also worth mentioning is Brian De Palma’s 1981 film Blow-Out, which yes, has a title that is confusingly similar to the Antonioni film. This one stars John Travolta, Nancy Allen, John Lithgow, and Dennis Franz, and I think it’s one of De Palma’s better films. It obviously owes a lot to Blow-up–and to a lesser extent The Conversation–but as a political thriller it works very well on its own. It also has more conventional conspiracy-theory angles than the earlier movies, which makes it an attractive choice for the film buff looking for films with that theme. Wormwood is a documentary of sorts, but probably not like documentaries you’ve seen. The story is about nominally about the mysterious death of Frank Olson, a scientist who apparently worked on a once super-secret government-sponsored project called MKUltra. But Wormwood is a very layered series, and it’s about a lot more than just that, as intriguing as the MKUltra (which was halted years ago) seems to have been. The mystery here related to the circumstances of Olson’s untimely death. Some aspects of it are clear-cut. Everyone agrees that at some point, Olson fell to his death from the window of his 13th-floor hotel room. But what caused this to happen? That, it turns out, is not at all clear. Was he disoriented because he had secretly been given a powerful dose of LSD? Was it suicide? Was he murdered to cover up something nefarious? All seem to have been possible. And what of the official explanations for his death? Were these also suspect? Some people came to believe not all was as had been stated. And in fact, the official story changed over the years. Wormwood is also the story of Olson’s son, who was never satisfied with what he was told about his father’s death and who has spent much of his life trying to uncover the truth, whatever that may be. That aspect of the story is as unsettling as any other element of it and raises a number of emotions. In Wormwood, Morris uses interviews, recreated scenes with actors, and a wide range of techniques to tell the story. Some people don’t like the way Morris subverts and blends different techniques and genre elements in the series, but I think the series does what it has to do to explore a confusing, frightening, and disturbing events. It doesn’t necessarily answer all the questions it raises, but it’s hard to imagine that any work would be able to adequately answer the deep and probing questions that emerge from Wormwood‘s story. Still, just because answers are hard to pin down does not in any way mean that it’s not worthwhile to ask tough questions. Morris does that admirably here in a compelling and thought-provoking production that is well worth watching. The Manchurian Candidate is filled with international intrigue and sly commentary about the American political system. Frank Sinatra, Angela Lansbury, Laurence Harvey, Janet Leigh, and James Gregory head an outstanding cast. John Frankenheimer, whose Seven Days in May was a previous selection in this series, brings a crisp and exciting style to the proceedings. I’ve written about this one elsewhere. You’ll find some of that in an article from Slate that you can access here. This week’s recommendation for a classic conspiracy or political-paranoia movie is Fail Safe, a dire 1964 thriller with an apocalyptic angle. If you’re interested in how political paranoia can play out on screen, it’s must-see material. Fail Safe is probably one of director Sidney Lumet’s less well-known films, but maybe that is not so surprising. After all, he had an astonishing output that includes dozens of titles, including Network, Serpico (which is a conspiracy film in its own right), Dog Day Afternoon, and Twelve Angry Men. The list goes on and on. Yet, while it may not be as famous, Fail Safe is a film well worth watching. Although it is steeped in the fears and anxieties of the Cold War at its height, I think it has a lot to say about political climates in any era that are prone to jumping to conclusions and acting before thinking. Without giving away any spoilers, the set-up of Fail Safe is compelling in its own right. The basic story starts with the premise of a nation relying on super-computers to manage lethal air defense systems and what would happen if those super-computers drew erroneous conclusions. As you might imagine, in a world where nuclear war could start with the simple push of a button (even if that is not literally the case), getting things wrong can lead to deadly consequences. The genius of Fail Safe is not the part of the story that says just that, though. Instead, it’s about how, or even if, it would be possible to undo really bad actions once they have been put into motion. Much about Fail Safe is reflective of the geopolitics of the 1960s. Arriving in theaters just two years after the Cuban Missile Crisis (and just months after the national trauma of John Kennedy’s assassination), this film tries to take a cold, hard look at the kind of world humans had gotten themselves into at that time. It is not a particularly optimistic movie, to say the least, but it’s a shrewd analysis of what happens when we don’t think things through or create systems that don’t allow us to think things through. The acting is to-the-point and effective in this one. Led by Henry Fonda and Walter Matthau, the cast also includes Larry Hagman and even Dom DeLuise, two of my personal favorites, in roles well suited for them. Meanwhile, the efficient direction keeps a complicated story easy to follow. Bold lighting choices and unusual camera angles add to the unsettling mood of the story. Fail Safe is definitely a movie if its time, but it’s also a film that still has a lot to say. This week’s recommendation is Invasion of the Body Snatchers, and the good news is that you have several different versions to choose from. All the versions are based on Jack Finney’s 1950s science-fiction novel about pod-people and a secretive alien invasion. As might be expected, the various versions of the film reflect their respective times. In the first movie incarnation, this seems especially the case. Although people involved in making the 1956 original denied that it was an allegory about the Red Scare and McCarthyism of a few years earlier, the film’s debut at that point in the Cold War makes those connections apparent, even if they were not intended. Indeed, the plot, which involves space-pod aliens assuming the identities of ordinary Americans, is only mildly conspiratorial in the usual sense, but it is steeped in Cold War paranoia. I tend to prefer the 1956 original, which was stars Kevin McCarthy and ‎Dana Wynter and was directed by veteran Don Siegel, who directed a lot of things including Dirty Harry two decades later. Many people like the 1978 version, which was directed by Philip Kaufman, even more. It’s definitely a contender, especially with a stellar cast that includes Donald Sutherland, Jeff Goldblum, Brooke Adams, Veronica Cartwright, and Leonard Nimoy. Less well known but worth a look is a 1993 version, simply titled Body Snatchers, directed by Abel Ferrara and featuring Gabrielle Anwar, Billy Wirth, Terry Kinney, Meg Tilly, Christine Elise, R. Lee Ermey and Forest Whitaker. It’s a looser adaptation of the original novel than the previous two film versions, but may still be of interest. And finally, with an even more abbreviated title, there is 2007’s The Invasion, which stars Nicole Kidman. (Veronica Cartwright, from the 1978 version, is also featured.) It changes the underlying story more than any of the earlier adaptations, but the influence of the original novel is still there. In a way, Invasion of the Body Snatchers may seem to be a story of its original time–a time that is now long gone. Yet, I think when future observers look back at the whole post-9/11 era, they are likely to see, if not outright paranoia, then at least a level of national anxiety and suspicion that rivals the national mood of the 1950s. In any case, no matter which version you choose, Invasion of the Body Snatchers is an intriguing film that probably says more about our culture overall than you might think. 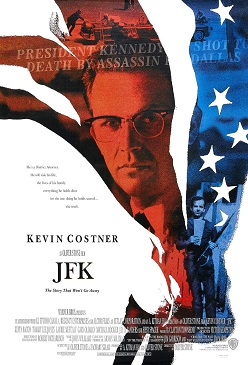 Oliver Stone’s JFK (1991) is this week’s recommendation for a classic conspiracy-political paranoia film. What you think about it as a movie will likely depend on what you already think about John F. Kennedy’s tragic assassination in 1963. If you’re the kind of person satisfied that Lee Harvey Oswald acted alone, which was what the Warren Commission determined shortly after the assassination, then Stone’s version of events may drive you crazy. But if you suspect that Oswald did not alone and that there was a larger and more sinister conspiracy at work, then there is probably something in Stone’s film that you’ll find intriguing. Whatever you may think of Stone because of his outspoken political beliefs, it’s hard to argue that JFK is not highly effective and original filmmaking. It’s partially based on theories devised by Jim Garrison, one-time District Attorney of New Orleans, but it extends its speculations well beyond that. Despite the fact that many writers, editorialists, and cultural observers concluded that Stone’s JFK was hogwash, many of these same people clearly were fearful that people would take it seriously. It’s easy to see why. Stone brilliantly marshals his creative powers to drive home his points. Some scenes are pure Hollywood, but Stone mixes in authentic archival footage and simulated footage to create a persuasive whole. In some ways, JFK‘s release in 1991 kicked off a decade of much conspiracy theorizing. American politics was becoming harsher and more cynical, creating ideal feeding grounds for growing conspiracy theories. In 1993, when the Fox television network launched Chris Carter’s celebrated series The X-Files, American culture was awash in conspiracy theories covering a wide range of topics. Doubts about the official story of John Kennedy’s death may not have created that situation, but widespread skepticism about the government’s version of events on that fateful day in 1963 surely played a part. Corporate America is often implicated in American conspiracy theories. With many people suspicious that big business doesn’t always have the best interests of its customers at heart, conspiracy theories often portray corporate America as not only callous but potentially downright evil. It’s a theme you can find in movies across many genres. Still, few movies portray corporations as wicked and conspiratorial as The Parallax View, director Alan J. Pakula’s 1974 film that’s the pick-of-the-week for a classic political paranoia movie. In The Parallax View, Warren Beatty stars as a reporter investigating a murder mystery. The clues seem to lead to the fictional Parallax Corporation. Unlike some other evil corporations of filmdom, the Parallax Corporation doesn’t make money selling some seedy product and then resort to murder to cover its tracks. No, for the Parallax Corporation, murder is not a side activity — it’s the company’s main product. Indeed, in a twist with metaphorical implications and irony, what Parallax sells is assassination. Of the many films Pakula directed, The Parallax View and two others — Klute (1971) and All the President’s Men (1976) — are loosely tied together with conspiracy themes. Neither of these others possesses the deep cynicism of The Parallax View, however. Coming after a decade in which Americans were losing faith in the society’s major institutions, it’s imbued with a sense of foreboding that may remind some viewers of The X-Files from some years later. The Parallax View is not as well known as many other movies with a similar theme. However, it’s an interesting comment on American attitudes in the mid-1970s, as well as an important part of the conspiracy movie canon. More than that, it’s an expertly crafted film that manages to cover some familiar territory in a new way. The Man Who Knew Too Much (1956) is this week’s pick for a classic movie with a conspiracy theme. Although often classified as a thriller, this classic Alfred Hitchcock film has conspiracy and political intrigue at its heart and is a worthy addition to the conspiracy-film repertoire. And we can safely surmise that Hitchcock himself thought highly of it. He made the film ― first in Britain, where Hitchcock made a version of the film in 1934 with star Peter Lorre, and later in the US, where a better-known version with James Stewart and Doris Day was issued in 1956. Although serious film buff will want to experience both versions of The Man Who Knew Too Much, even casual movie fans should add the 1956 version to their list of films to watch. That version is our pick of the week. The new version of The Man Who Knew Too Much was released during this time. Hollywood was trying desperately to differentiate the experience viewers had in theaters from the more intimate viewing experiences they had watching television in their living rooms. The Man Who Knew Too Much surely provided such an opportunity. With its wide-screen format and with images bathed in the lavish color palette of 1950s Technicolor, it was a visual feast compared to anything television was capable of offering at the time. The format was ideal for Hitchcock’s transcontinental storyline, in which James Stewart — a Hitchcock regular — plays an ordinary man placed in extraordinary situations beyond his control. Indeed, the film starts out as though it is a travelogue. McKenna, an American doctor, is vacationing in Morrocco with his wife Jo (played by Doris Day) and young son Hank. It all seems innocent enough, though modern viewers will likely note the dismissiveness — characteristic of the era — that the film shows to non-Western cultures. Playing an optimistic American everyman, Stewart’s character stumbles into intrigue after witnessing a murder in broad daylight. Soon, son Hank is placed in danger, and the story then follows efforts to secure the boy’s safety. As the action moves forward and shifts to London, it becomes clear that this is no simple crime story. Instead, Ben and Jo McKenna have become pawns in a complicated assassination conspiracy with international consequences. The conspiracy angles to the proceedings have many of the hallmarks that continue to appear in more recent conspiracy movies. Played to melodramatic perfection by Stewart, the McKenna character is both worldly and naive. The more he is out of his element, the more prone to panic he becomes. Meanwhile, viewers — like McKenna — are left trying to figure out which characters can be trusted and what is actually going on. It’s the classic stuff of the conspiracy film. Hitchcock seems to have had a complicated relationship with female actors, to put it mildly. His relationship with the female characters in his films is no less complicated or straightforward. Modern viewers may note the manner in which Ben McKenna, the solid family man with strong Midwestern values, treats his wife Jo as the story unfolds. Jo, the story tells us, was a successful stage performer and surely more well-known than her husband. Ben McKenna seems to adore her, but his adoration hardly seems to be one between equals. When young Hank is placed in danger, Ben McKenna decides that his wife is not strong enough to bear the news, so he insists that she take powerful prescription sedatives before he will explain the situation to her. It’s hard to know exactly what Hitchcock had in mind with this scene (apart from the obvious sexism), and I think many viewers today will find it jarring. In any case, to modern eyes, the scene seems to show Ben McKenna, rather than Jo McKenna, as the weaker character. I doubt many viewers would expect to find Doris Day’s famous song “Que Sera, Sera (Whatever Will Be, Will Be)” as a key element in a conspiracy film, but in The Man Who Knew Too Much, it has a special importance. Is that realistic? Probably not. But then again, The Man Who Knew Too Much doesn’t succeed by aiming for realism. In fact, it’s a highly mannered film, with many elements that in the hands of a less capable director would seem preposterous and ordinary. But, like a skilled conspirator, Hitchcock excels at manipulation. Off-screen, that may not have been a good thing. On-screen, however, it allows him to put together compelling cinematic works that add up to more than the sum of their parts.